In our pursuit to provide you with the very best precious metals products, Money Metals recently made a special arrangement to offer bars made by PAMP Suisse, widely considered to be the premier name in the retail bullion market. The Swiss-based mint’s products are well known throughout the world for their classy and popular design. 1-gram, 2.5-gram, 10-gram, 20-gram, 1-ounce, 50-gram, 100-gram, and 10-ounce sizes. Each of our new PAMP Suisse gold bars are .9999 pure, is packaged with a tamper-evident assay card to guarantee weight and purity, and also contains the brand new Veriscan® technology – exclusive to the PAMP Suisse refinery. This technology uses microscopic topography to identify products in PAMP’s database. When manufactured, each bar is scanned and is able to be re-scanned later to verify the authenticity of the gold bar. This new partnership gives our customers a chance to purchase smaller bars in both platinum and palladium as well. We are pleased to introduce the 1-gram platinum and 1-gram palladium bars to our ever-growing product lineup. A full troy ounce contains 31.1 grams, meaning a single gram is about a third of the size of a 1/10th-ounce product. Own All Four Precious Metals at Once! But perhaps the most exciting new product of all is the PAMP Multigram Portfolio. Each pack contains 4 bars of each of the 4 precious metals (gold, silver, platinum, and palladium) in barter-ready 2.5 gram sizes. The Multigram Portfolio is designed to be separated into 16 individual sections, each containing a bar and marked with the PAMP name, serial number, weight, and purity. It can also be separated vertically to include a sheet of one 2.5 gram bar for each of the four metals or horizontally if one wishes to keep each specific metal together and separate from the others. 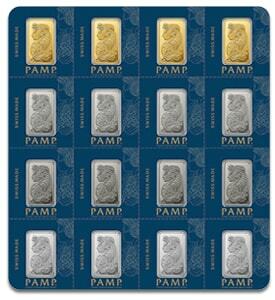 Precious metals stackers can buy PAMP products with the utmost confidence. Their security technology mentioned above is pioneering in the industry. The beautiful PAMP design is coveted around the world, and the quality is second to none. Aside from PAMP Suisse’s technological advances, this Swiss refinery also sets itself apart with the designs that ornament their bars. The PAMP Suisse bars are adorned with the image of Lady Fortuna, a Roman goddess who is believed to bring individuals good luck and fortune. This design depicts the goddess bestowing countless riches upon an unknown recipient. Lady Fortuna is shown blindfolded signifying that she can’t see to whom she is extending the cornucopia filled with coins. Investors are particularly impressed with the bar’s attention to detail in the design. On the reverse side of the bar, the PAMP name is engraved in another meticulous design followed by the bar’s weight, purity, and certificate number. The information provided on the back of the bar further establishes its authenticity. 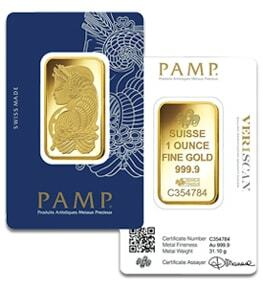 Money Metals is extremely excited and proud of this new relationship with PAMP. This arrangement will provide our customers with some of the very best bullion options in the industry. For pricing, information, or to place an order for any of these new PAMP products please visit www.MoneyMetals.com 24 hours a day, seven days a week. Or call one of our no-pressure and non-commissioned Precious Metals Specialists at 1-800-800-1865. You can reach us anytime between 7 am and 5:30 pm Mountain Time, Monday through Friday.